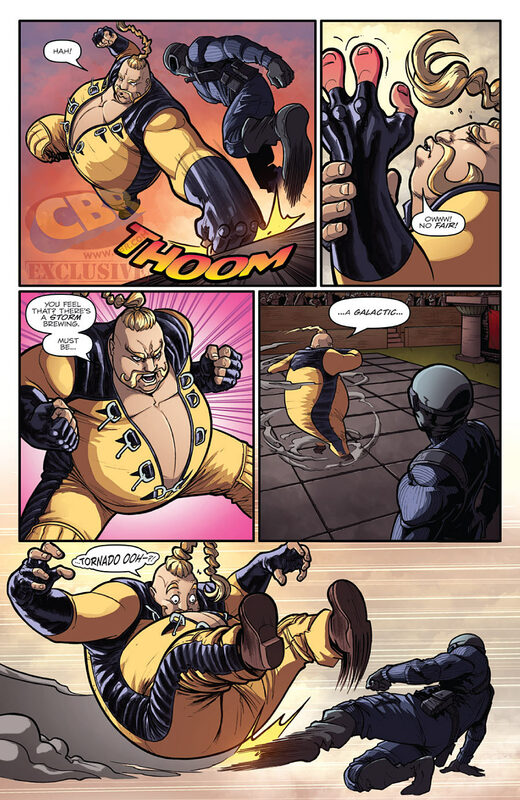 By way of Comic Book Resources comes this preview of IDW Publishing’s Street Fighter x G.I.Joe #3! 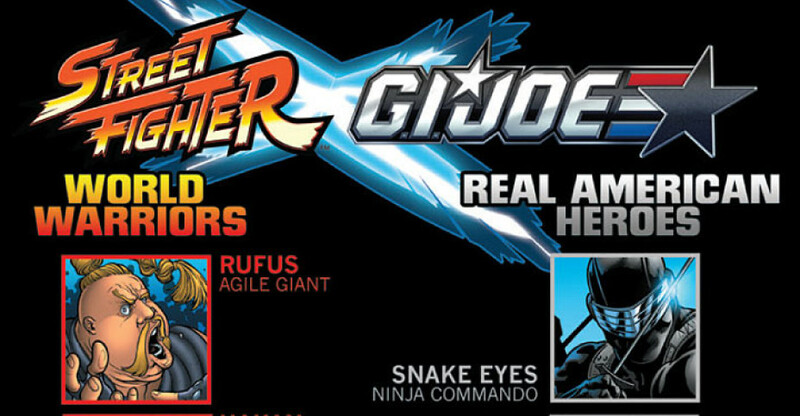 The latest issue in the Street Fighter x G.I.Joe series is due out on Wednesday, April 27th with a cover price of $3.99. We’ve mirrored the preview here, so join us after the break to check it out! 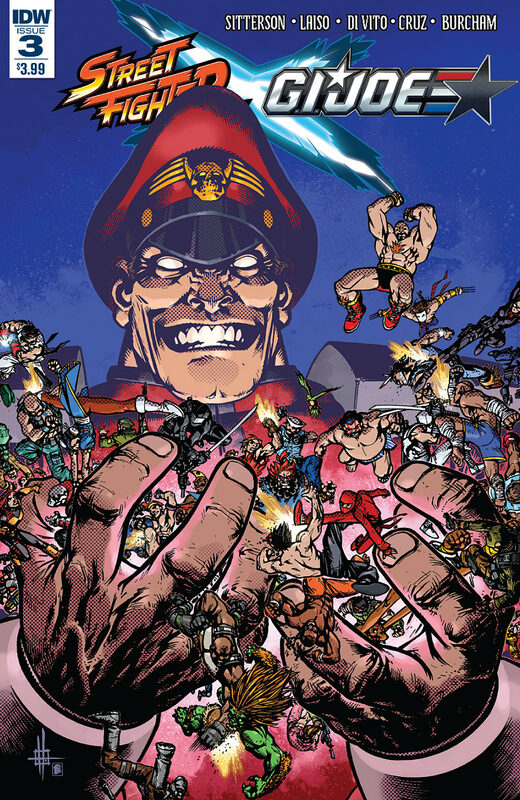 Seeing the cover for this issue, makes me wish Hasbro would release (ModernEra sculpt) Street Fighter figures again. sigh. I doubt Hasbro will pay Capcom to release Street Fighter figures. Hasbro's main focus are Star Wars and Marvel, unless by some miracle SF has a blockbuster film coming out in the next couple of years. Also if it does happen they'll start with Ken, Ryu, Bison, (maybe)Chun Li. I want to see Akuma, Crimson Viper, Cammy, Fei Long, Rolento, C.Jack, Doctrine Dark, Skullomania, and T-Hawk. I've got to ask, what the heck is going on here? 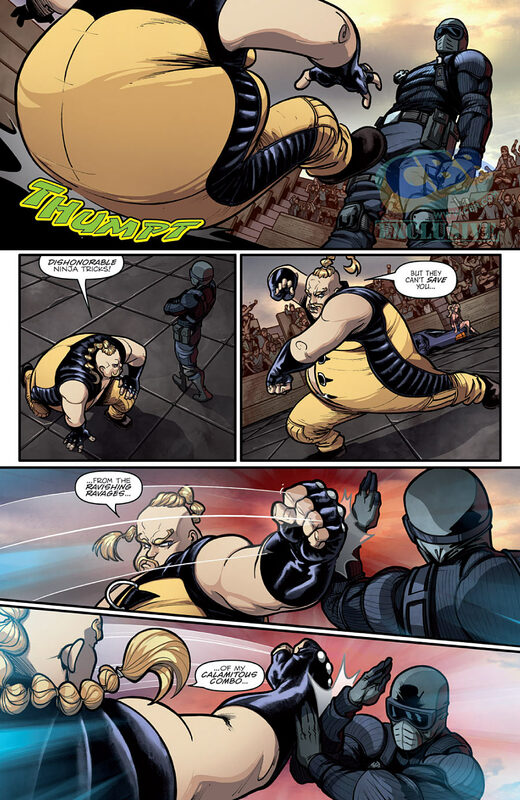 The top fighters (Ryu and Snake Eyes) both threw their matches. And Storm Shadow, who was supposed to lose, refused. Meanwhile more junior fighters like Jinx are deliberately advanced. I'm really curious to see how this plays out, because the various parties all seem very keen to shape the final fights into an unexpected bracket. Meanwhile, SE very OBVIOUSLY threw his match. How does THAT help? Well... I'm pleasantly surprised. 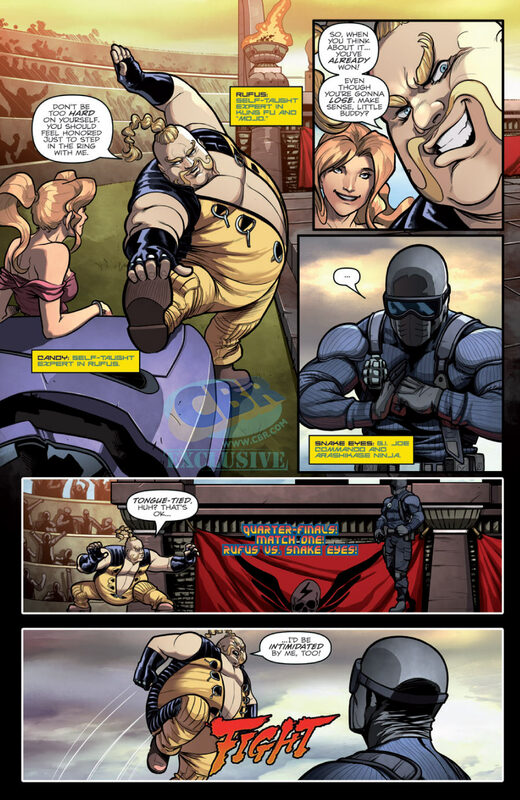 I was wrong about Snake-Eyes making it to the end against Bison. 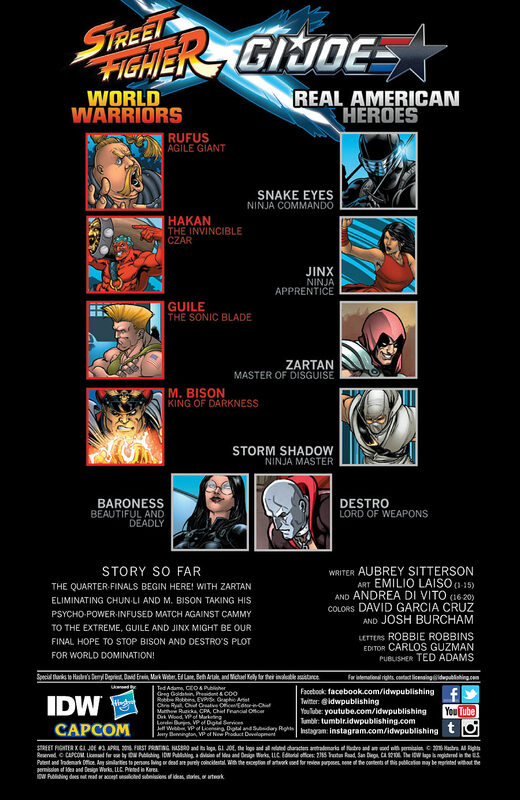 And Storm Shadow is apparently not a Cobra agent anymore, if the little 'x' through "Cobra" means anything. Which brings me to Fight Two. As 'Tankers probably know by now, Jinx is one of my favorite characters. It is totally crazy that she started to manifest the Satsui no Hado, which is usually Ryu's gimmick. Is this the Joes' real plan? Snake Eyes and Ryu dropped out so that Jinx can fight Bison and unleash a dark power? I'm a huge fan of Guile's new look. I want to make a custom of him. I suspect using an Elite Horseman figure from 50th Ann. would be a good start. And the ending was great. As much as I like Storm Shadow, I knew he would lose to Bison. I was genuinely scratching my head when he submitted to Bison, but it all made sense at the very end. I appreciated this because I think very often in GI Joe the ninjas come across as costumed superheroes and we forget that deception is (or rather, should be) at the core of what ninja are about. All good points! However, did anyone else notice that Storm Shadow now has an "Arashikage" tattoo on each arm? And they aren't representative of the normal tattoo we are used to on Snake-Eyes and Storm Shadow, either! I wonder if this was intentional or not??? Could this "Storm Shadow" be an imposter??? Or is it just an alternate reality glitch? Artist error?